I have not been in the mood to post this week due to my concern for my family and friends back home in New Jersey. Hurricane Sandy has wrecked havoc in the Motherland. I am happy to report that -- so far -- I have been able to confirm that all my peeps are safe but I am so sad for those who were not so lucky. Sandy made landfall right where I grew up on the Jersey Shore and it is devastated. Many have lost everything. I have had very limited correspondence with my family because they have no electricity, gas or water back home. Phone service -- cell and landlines -- has been spotty. They say it could be another week before power is restored. The water is undrinkable due to elevated sewer levels. Fires still burn. Power lines are still down and, it is not only still dangerous, but it is a mess. I feel so helpless and frustrated being all these miles away and unable to help support my family and friends. In the long run, I know they will be OK and the Garden State will pick up the pieces but for now, I mourn for my tribe. Created exclusively for Sephora, NARS pays homage to Warhol’s famous silkscreen flora with three palettes for painting the town, each emblazoned with a Warhol witticism. Memorable quotes etched onto the interior mirrors include: "If you can convince yourself that you look fabulous, you can save yourself the trouble of primping." (Flowers 1); "You need to let the little things that would ordinarily bore you suddenly thrill you." (Flowers 2); "All is pretty." (Flowers 3). The collection is a muse to the American artist and brings its own mixed media to the masses. On Sunday, I will be participating in my 7thhalf marathon. I will wake long beforedawn and make my way to the heart of the City of Angels to run in the LosAngeles Rock ‘n’ Roll Half Marathon. This year, the course starts in downtown L.A.and will take me running down to the University of Southern California andaround the L.A. Coliseum; returning back through downtown and passing throughthe warehouse district and Japan Town; and ending back at L.A. Live just intime for The Dirty Head’s concert. Ahalf marathon is only 13.1 miles and not 26.2 like a full marathon. But ittruly takes dedication and perseverance to just get out there and go that far.Not to mention the importance of a training regime to prepare not just yourlegs and body for the long run, but your mind as well. As far as I can remember, I have always lovedto run. When I was a little girl, mypediatrician said that my legs were made to run and I just sort of acceptedthat as truth. When I was17 years old, I landed a job at a gym in my suburb of New Jersey. I worked thefront desk from the time I was in high school until I left for university. Ican thank that job for getting me into fitness and running for sport. When I moved to New York City, I tried to keep up with my running but with the pressure of school and work, I just couldn't always find the time. Mostly, I felt that I was running away from the scary people on the pre-dawn streets of the Big Apple. In2000, I celebrated the Millennium by running in my first full Marathon with mysister-in-law. Since then, I have tried to participate in a half marathon everyyear and a myriad of 5- and 10-K races as well. Icontinue to train for these races because I have a passion for running but, Itruly believe, it is in my genes and I am prepared to pass it on. Myfather, who went to college on a track and field scholarship, has allowed hislong legs to carry him far and now I am realizing that my own son has therunning bug. 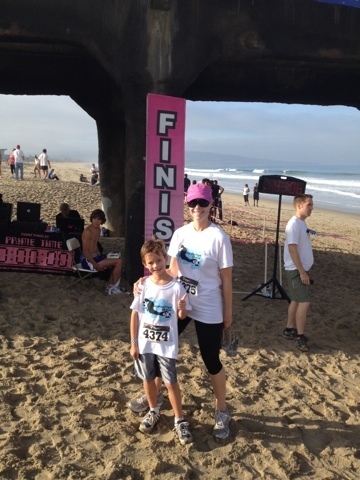 Overthe last eight years, Shane has watched me lace up my sneakers and pound thepavement so you can imagine my pride – and surprise – when he told me he wasinterested in running Manhattan Beach’s Summer Solstice 5K back in June. Personally,I thought 3 miles would be daunting for him, but we showed up and he was readyto win. I tried to explain to Shane thatit wasn’t about winning but more about the experience. He was not to be dissuaded and took off likea bat out of hell. Isoon realized that I had made a rookie mom mistake and forgot water for myseven-year-old. After a mile and a half,he told me in an extremely husky voice, "I think I swallowed thesun Mom." I felt terrible and concerned, butShane would not quit and, even though we walked a little bit, he was theyoungest person to complete the family race in about 39 minutes. Then he went on to win first place in a halfmile race for his age group immediately after having a rest and some water. This fall, Shane started his third season of football in the BeachCities Flag Football league. InSeptember, my husband and I applauded his 30 yard touchdown and were proudparents. Two weeks later, when he rananother 55 yards to score for his team, we were floored by how fast heaccelerated and amazed that he could not be stopped. After another 80 yard touchdown last weekend, people are starting totake notice of his speed. As a mother and a runner, it makes my heart sing to watch Shane’slittle legs pump and his impossible speed makes him look as though he is ridingthe wind. Shane and my husband will be there at the finish line to cheer me on this weekendand Shane asked me if I was going to win. I said no and tried to explain that, for me, running about going the distance,building endurance and getting a little Zen along the way. Ok, call it what you will: Oxblood, Maroon, Bourdeaux. The color is rich, sultry and mysterious all at the same time. I am loving it and it has nothing to do with Halloween. This past week, the fashion industry in Los Angeles hosted its own version of Fashion Week to showcase the Spring/Summer 2013 Collections of local designers. Considering its Tinsel Town locale, LA Fashion Week (LAFW) did not seem to exude (to me) the same level of glitz and glamor in which the New York, London, Milan and Paris runway shows are so famous. Ultimately, I am very happy to report that the Los Angeles fashion industry is alive and thriving in this challenging economy; however, I was disappointed because LAFW seemed to be strictly an “industry” event for buyers and media (which didn’t include me…wah). My disclaimer is that I did not actually attend any of the runway shows or events because most were not open to the public and all of my research was done online with the exception of my opinion. I was very excited for the 12-day event which started on Wednesday Oct. 10 and will conclude this coming Sunday Oct. 21. I know LA is not New York, Paris or even London; but it is a pretty cool city and I was excited to embrace some of the emerging and local designers here in the City of Angels, which happens to be right in my own backyard. According to the LA Fashion Week website, on Oct. 10 and 11, the newly founded LA Fashion Council had its debut at the Carondelet House in the MacArthur Park section of town and a fashion show at the W Hotel in Westwood, which is part of a new monthly series featuring recurring LA fashion talent. The list of participating labels included: GAIN, Korovilas, ISM Mode, White Sycamore, Shallow Fashion, Kittinhawk, Bijou Van Ness, Pop Molly, the Bohemian Society and Jen Awad. LA Fashion Week also featured the introduction of Africa Fashion Week and the turn of Elite Curves Haute Curves at the Los Angeles Convention Center. On Oct. 11, Project Ethos combined efforts with the Downtown Los Angeles Art Walk for the first time. The event was open to the public and included 9:30 and 10:30pm runway shows. These featured emerging designers such as Jose Galeana (Galeana Designs) and Lawren Michele Cappelletti (Lawren Michele). Style Fashion Week LA returned to the Vibiana in downtown LA on Oct. 15-19, stated the LA Fashion Week website. One of the biggest highlights of the week was a runway show and fundraiser on Oct. 16. The event, which was organized by Fashion Business Inc. and hosted by Melissa Rivers and comedian Brett Walkow, took place at Union Station in downtown. According to an article on latimes.com, the event “All Aboard … L.A.’s Fashion Platform” was a “nod to 1930s films and the lore of locomotive.” They showcased 11 California-based brands including Unspoken Lingerie, Johnny Was, Living Doll Los Angeles, San & Lavi, XCVI Continuous Line, Liberty Sage, Gelareh Designs among others. LAFW will conclude this coming weekend with LA Fashion Weekend on Oct. 19- 21 at Sunset Gower Studios. According to latimes.com, the designer lineup still has yet to be announced; organizers expect to present at least three multi-brand runway shows, one dedicated to swimwear labels. Now I don’t claim to be an expert on all things fashion, but I absolutely love it and try to do my best to be educated. So I was somewhat shocked that I wasn’t familiar with hardly any of the designers that showed their collections this week but I am so glad that I’ve had this opportunity to write about it and to put the names of these designers out there. They may not be as well-known as Rebecca Minkoff, Marc Jacobs or Michael Kors yet, but they have proven their talent on a local level. Right at this very moment, I am living in dread as I am having dresser’s remorse. This morning, I had a 7am dermatologist’s appointment. Now don’t get me wrong, I love that my doctor’s office will see me so early in the morn. However, typically, I lay out my outfit and pack for work the night prior to my early wake-up call. As you can probably imagine where this is going, I did not take the time to style myself in advance and am now having what I think is worse than a bad hair day – wait for it – a bad outfit day. At least with a bad hair day, you can always swoop your lack-luster locks up in a pony or – if you are not in a professional setting – a hat works just fine to keep those frizzes under control but, with a bad and ugly outfit, well there is just no getting around it. I knew I was in trouble when it was 6:55am and I was still at home deep in the bowels of my closet. My dilemma stemmed from the fact that the Santa Ana winds have rolled into Los Angeles and we are having unseasonable warm weather. Yet, when I arrive to my office, the air conditioning is running full blast by the drones that control our automated HVAC system in our building. I thought a long flowing skirt layered with a tank and a cropped sweater would be perfect solution. Actually, I think it could be the perfect outfit but just not the particular garments that I am currently wearing all together. With three minutes to get to my appointment, I threw a few other tops into my purse and I was out the door. I knew I was in trouble when I got out of my car at the doctor’s office and realized that I had even had the audacity to buckle the cutest teal-colored skinny belt with suede tassels around my sloppy waist.No offense to the belt because it is “the” cutest when worn solo, but I had about 4 trends going on at one time and it was not pretty. On my drive into work, I still hadn’t given up hope. I figured that I could probably save my outfit once I arrived at the office since I had a few options in my purse. So you can imagine my disappointment while, in the ladies room, I realized that Plan B and C were worse than what I was actually wearing. Suddenly, I was like a cornered animal in the bathroom. I racked my brain: What could I do to get out of this dilemma? Short of chewing off my paw…arm…belt, I thought that perhaps I could tell my boss that I left an important document at home and needed to dash 40 minutes each way to change outfits. Even he would probably recognize the outfit change and might think I was fickle and shallow. Then a light bulb went off in my head: an early lunch and a quick dash to Nordstrom rack. Once again, I would probably be called out by co-workers because my tangerine colored cropped sweater is pret-ty loud and, once again, I would have to explain myself (fickle and shallow) and my dressing quandary. How embarrassing? Most folks at my office just would not get me on this one. Let’s just hope the fashion police don’t find me before then, if so, I might find myself “Worst Dressed” in the pokey. Last week, I saw a post come through via DailyOm that just warmed my heart. I had been sick for a few days and just wanted to find a hole to crawl up in and be left alone. Due to feeling under the weather, I had been abnormally silent and keeping to myself, which is so UN-Tracy. Despite not feeling very social, it was so nice to get an email or two and a phone call from a few of my closest buds checking in to see if all was well and why I had been so silent. It made me reflect upon all the amazing women in my life and how much I appreciate each and every one of them. I am blessed with so many besties and I hope you are too. Our best friends are a warm refuge in which we feel free to be fully ourselves. Can Zombies Wear Cowboy Booties? I know Halloween is upon us and I certainly could have been mistaken for the "Walking Dead" -- the new AMC zombie television series -- over the past few weeks. But alas, I just had a very bad sinus infection; however, I am happy to be back among the living just in time for spooky all hallows eve. I always know that I am really sick when I can't even think about nor do I even care about fashion as that is what is on my mind 24/7. So as my haze started to fade, I realized that I still hadn't reconciled my fall boot dilemma even as Thanksgiving and Christmas decorations start filling the shelves at local stores. Back in September, I was contemplating a pair of knee-high wedges, but now I'm feeling a little bit country and contemplating a low-heeled Western bootie. The pros: a comfortable heel that I could wear and wear and wear; perfect for all my skinny jeans; cute with long skirts. The cons: Too trendy and bit costumey since I don't live in Western World. Well, I just had to let you all know that All Things Fashionating will return to its regularly scheduled format tomorrow. With the start of school and a change of the season head cold, I have been down for the count for the last 10 plus days. Just existing in my own skin has been a challenge. Since ATF is my baby, I always feel super guilty when I don't give her the attention that she deserves and I have missed posting in a big way. I am glad to be feeling better and looking forward to getting back into the swing of things. Hey You! Yeah, I'm Talking to You... Do Whatever You Can to Prevent Breast Cancer! 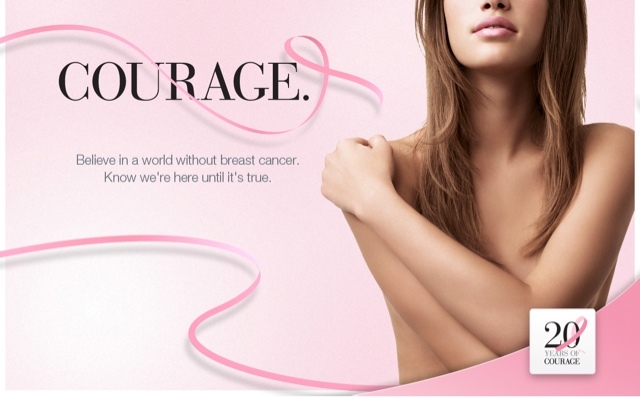 With October being Breast Cancer Awareness Month, I want to share some information with you. I think almost every person out there has had the "Big C" affect one or more peeps in their lives. My family has lost some very important people -- such as my mother- and father-in-law -- to lung cancer. Most recently, my Aunt Beth was diagnosed with breast cancer. Due to her annual mammogram, she caught it early -- at stage one -- and is in the process of battling it as I write these words. 5. Do self breast exams. 6. Respect your genetic history. 8. Moderate drinking of alcohol. 10. Get screened for everything else. However, breast cancer today does not discriminate and several of my closest gal pals have found themselves face-to-face with this devil even though they don't fit the typical profile and were healthy to boot. With aggressive treatments and love, sweat and tears, they are survivors but not without a fight and sometimes the story does not have a happy ending. My friend Jennifer Scarlet Buchsbaum honors her cousin Karen on her website. Karen lost her battle with breast cancer and, she had the unthinkable happen, she left a young child motherless. "In support of Breast Cancer Awareness Month, 39% off all purchases made at www.jlynn-jewelry.com during the month of October will be donated to The Breast Cancer Research Foundation. Enter PINK at check out and you will also get 20% off your purchase. To find out why I chose to donate 39% please read my latest blog post..."
I implore every female reader out there to heed this post and truly know that prevention and early detection can help to save your life; Isn't it worth saving? Since I'm not really in the market for a new pair of sunnies -- although I am desperately feeling like my sunglass repertoire is lacking -- I found these super affordable but stylish shades online. The Weekend Acetate Sunglasses, which are UVA/B protected, can be found on Spitfire for a mere $39. Interestingly enough, I would like to shed some light on Spitfire which is one cool website. The site sells hip sunglasses, colorful headphones and MP3 players that look like old school cassette players. With disco balls, aliens, giant Japanese good luck kitties and ducks dotting its pages, Spitfire is a very random site but all of its creativity and cool products just sort of..."makes the future look bright."